Sustainability is a big issue these days and applies to every aspect of life, including fashion. It can mean a lot of things, using sustainable materials, using sustainable construction methods, recycling old clothes, etc. Sustainability also raises some issues with fashion, as fashion changes constantly by it's very nature, which means throwing out the old and bringing in the new. You can read some great posts on sustainable fashion at Worn Through here and here. With this theme in mind, last spring I was a designer for COUTURevolution, the University of North Carolina at Chapel Hill's second annual sustainability fashion show. The designers took many different routs with their clothes, from reworking old clothes into new fashionable pieces to using recycled products. As for me, I chose to bring a little history into my designs. 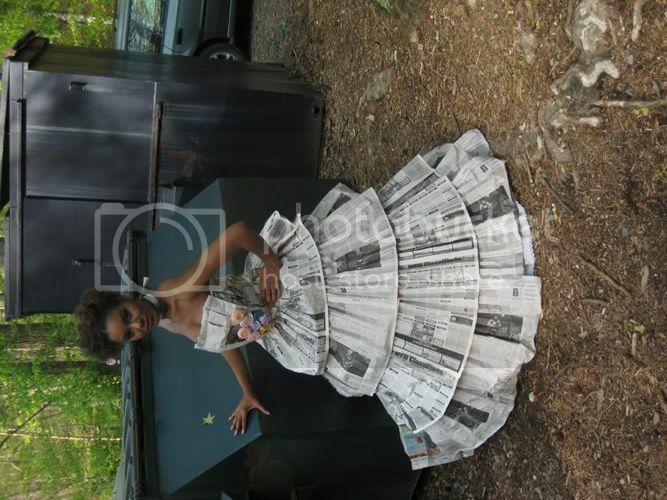 This dress was made from issues of The Daily Tar Heel, UNC's daily newspaper. I raided all the newspaper boxes late one night, much to the confusion of everyone who walked past me, but I'm quite proud of the result. The flowers are made from fabric scraps I took from the scrap bin at the UNC costume shop. The skirt is made of pleated newspapers built on top of my hoop skirt (unfortunately as the day wore on all my perfectly sculpted folds started getting a little messy, one of the hazards of working with newspaper), which I adjusted into a conical 16th century shape (it would have been called a farthingale back then). The bodice is pleated newspapers on a muslin base. Not only does this dress invoke the 16th century, it also invokes the 1960s, when there was a fad for wearing dresses made of actual paper. A topic for a future post! My other dress was an homage to my favorite era ever, the 18th century. This one is made out of black and white trash bags, and unfortunately did not photograph as well as the newspaper dress. The bodice is actually made of very tightly gathered trash bags, the vertical folds created were just gorgeous. The skirt is three layers, and the trim is actually pleated in an 18th century style. The skirt is supported by plastic shopping bags stuffed with more plastic shopping bags (my roommate was thrilled to get rid of all the plastic shopping bags we had sitting around). More amazing photos, of my dresses and the others, taken by an actual professional can be found here. Big big thanks go out to my two amazing models, who worked their outfits like pros. They were fierce!